A fluid additive specially formulated to enable paint to flow easily across a surface. It thins paint to the ideal consistency, creates cell effects, and reduces cracking and crazing. It will not slow down the drying time, alter the color, or lessen the adhesion of paint. 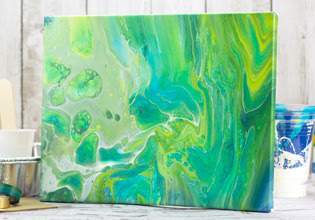 Mix with Americana Acrylics or DecoArt Media Fluid Acrylics to create stunning effects on canvas, wood, or other art surfaces. Ratios can be adjusted for a variety of effects. Mix slowly into paint to avoid creating bubbles. Begin mixing using these basic ratio guidelines and adjust until mixture is thin enough to flow easily off of surface when poured: fluid acrylics: 2:1 Paint to Pouring Medium; craft acrylics: 1:1 Paint to Pouring Medium; medium body acrylics: 1:3 Paint to Pouring Medium; heavy body acrylics: 1:6 Paint to Pouring Medium. Once paint is dry, finish with DecoArt Clear Pouring Topcoat if desired. Water-based. Non-yellowing. Soap and water clean up. 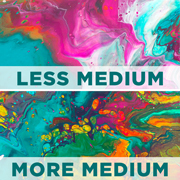 Pouring Medium is a water-based product, designed to be mixed with water-based paints. Introducing water or other additives other than DecoArt’s Pouring Medium into your paint may compromise the integrity of the paint's adhesion to the surface. 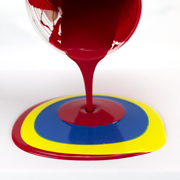 Pouring Medium was specially-formulated to thin paint to the ideal consistency for paint pouring techniques while maintaining the adhesion of the paint. Care should be utilized when using tape to mask off the edges or other areas of the surface. When removing the tape, there is the possibility of breaking the film created by the paint. When removing the tape, wait until the paint is dry to touch. Use a craft knife to score along the edges of the tape. This will ensure the paint will not be pulled up with the tape. Having a clean workspace is essential for creating beautiful pour projects. 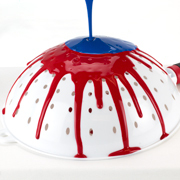 Utilize common household items to make paint pouring easy and cleanup quick. Freezer paper or disposable tablecloth – for covering work area (don’t forget the floors). 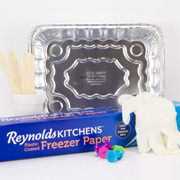 Foil roasting pans – for containing run-off paint. Ideal for standard surfaces. Use a washing machine drip pan for larger surfaces. Disposable cups – larger cups for mixing and pouring, smaller for elevating canvas. Clear cups make it easier to see what quantities and layers you are pouring. Gloves – keeps hands clean while mixing and pouring. Craft Sticks – these inexpensive, disposable tools are very practical for mixing paint or smoothing out the edge of a canvas. 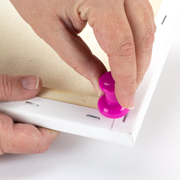 Push Pins – large push pins can be used as props to elevate canvas or to create “handles” for easily tilting the canvas back and forth. After mixing the medium into each color, layer each color into a single cup. The first color you pour into the cup will be the last to appear on your surface and likely the most prominent. Pour straight on your surface or place surface face down over cup and flip. See the dirty pour technique in action. 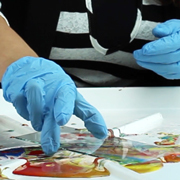 Keeping your color mixtures separate, alternate pouring directly onto surface. Tilt surface to create a marbleized pattern. Pour individual color mixtures directly onto the surface, layering them on top of each other in one puddle. Tilt surface to move paint. One of the most exciting things about paint pouring is the unpredictable nature of the way paints will interact. 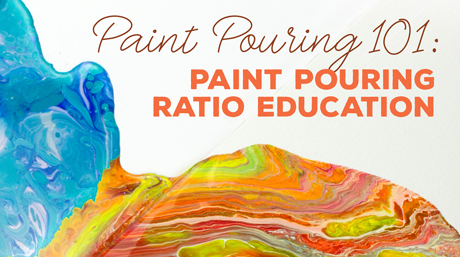 The pouring medium ratios are simply a starting point. Increase the amount of Pouring Medium to increase the cell effects. A torch can be used to increase cell effect. Use caution and adhere to manufacturer's recommendation for safe practices. Try using household items to create unique and interesting effects. Strainers, soda bottle bottoms, funnels, and toilet paper rolls are great items to begin experimenting with. 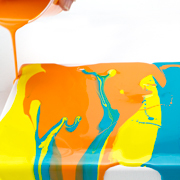 When creating poured art, inevitably there will be excess paint left in a cup or in the drip pan. Here are a couple of ways to use up that extra paint! 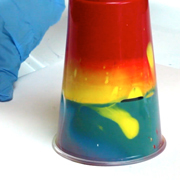 Use leftover paint in the cup on a second piece of art. Just pick a favorite technique and pour. 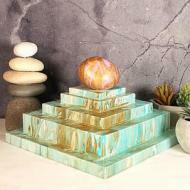 Create a glass imprint with run-off paint in the drip pan. Simply take a piece of glass and gently press it into the paint, making sure the underside is completely covered. Lift and set on cups to dry. 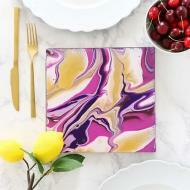 Paint that has dried in your drip pan can also be peeled off and added to mixed media art or jewelry pieces. 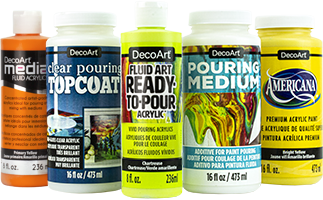 Learn more about acrylic paint pouring from the DecoArt team.